Enjoy these maps of our region. Both the US and Mexico make available free high quality, detailed topo maps! 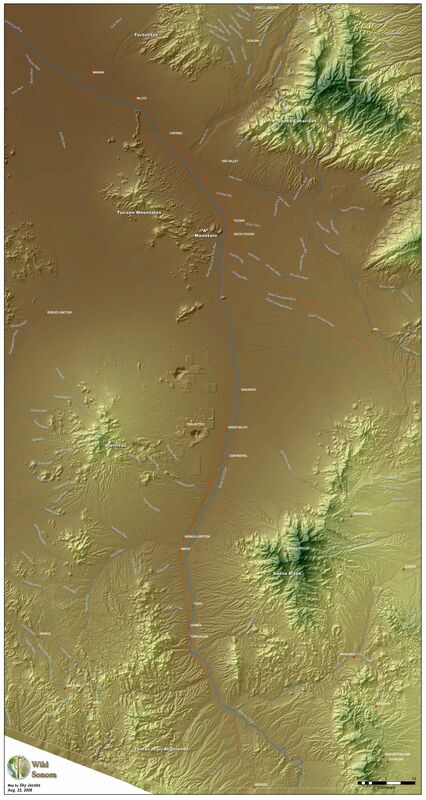 To download US topo maps at various scales use this link to the USGS Store. To download Mexico topo maps you will be asked to create an account then you can download Inegi maps here. Also see this interactive map of Mexico. Plant community map of the Sonoran Desert, Sierra Madre, Sky Islands, and adjacent land. A very general look at the major biotic communities of the region. This map shows major vegetation communities that influence species richness in our Sky Island region. Concept originally designed for Sky Island Alliance around 2007. Sonora Mexico rainfall map in 50 and 100 millimeter increments. The data used in this map is several years old, although still fairly accurate. Here is an updated verision of this map, which was done with a dataset that has different (curvy) boiundaries for municipios as well and the Chihuahua border. The map below is likely more accurate. I mostly made this map for my own use, since I have a hard time always knowing what municipio I am in. It is basically a draft map. Hopefully you find it useful as well. Click on the map to open fully in your browser, then click again in most browsers to enlarge the image. This map does not include much of the Cienega Creek tributary. Southwest U.S. and northwest Mexico vegetation community map by Brown and Lowe.